A diverse selection of seminars is scheduled starting next weekend and running into summer through the Spokane Parks and Recreation Department’s Explore and Discover Program. Encounters with wildlife, May 2 at CenterPlace in Mirabeau Point Park, 2426 N. Discovery Pl., Spokane Valley – Learn what to do in close encounters with wild animals including skunks, coyotes, cougars, bears and moose. Geared to all ages. Come and go to ongoing seminars, videos and information tables, 1 p.m.-5 p.m.
Great Ice-Age Flood in Washington, June 6 – Field trip by van to discover how floods shaped Eastern Washington’s landscape, including Steamboat Rock, Northrup Canyon, Grand Coulee Dam and Dry Falls State Park. Cost: $37 or $27 for youths under 17. Ambassador Wolf Program, June 6 — Meet a live wolf and learn about the species’ natural history. Cost: $18 or $11 for youths under 17. Native bats of the Inland Northwest, June 21 — An evening seminar to discover bats in Riverside State Park. St. Joe River cruise, June 21 — A six-hour cruise leaving from the Coeur d’Alene Resort with a priority for wildlife watching. Cost: $36 or free for youths under 13. Astronomy basics, Aug. 15 — Discover the night sky through a telescope at the Bowl and Pitcher. •Details and preregistration: 625-6200; www.spokaneparks.org . •Don’t feed them or habituate them to human contact. These and other basic concepts will be explained with seminars, videos and literature on Saturday afternoon during a free “Encounters with Wildlife” program at CenterPlace in Spokane Valley’s Mirabeau Point Park. The topic hits close to home. Critters ranging from ground squirrels and coyotes to cougars, bears and moose are frequenting the city limits of Inland Northwest towns and cities. Spokane-area Fish and Wildlife Department officers responded to a record number of moose encounters this winter, including a cow and calf hanging out at Liberty Lake day care and a cow moose that stomped on a woman defending her dog. In both of those cases, at least one moose was killed in the response. “The animals almost always are the losers when they frequently come into contact with humans no matter how well-intentioned,” said Chuck Bartlebaugh, director for the Missoula-based Center for Wildlife Information. “I’m particularly concerned about the misinformation that seems to be proliferating on TV and in books and magazines that are promoting things like feeding bears in the backyard – which you should absolutely never do – or getting close to big wild animals that can be dangerous,” he said. Bartlebaugh’s center, which will take part in Saturday’s program, is supported by the Interagency Grizzly Bear Committee and other state and federal groups to educate the public, especially children, on being better neighbors to wildlife. “A lot of grizzly bears have died because people allowed food or garbage to lure them in to conflicts,” he said. John Murray, working with the Spokane Parks and Recreation Department, has organized Saturday’s Encounters with Wildlife program as part of a series of wildlife outdoor programs this spring. “We especially want to connect with children,” Bartlebaugh said. “There’s a lot of TV programming that shows kids interacting with wildlife. I’ve seen a piece with (Wildlife Warrior) Steve Irwin’s daughter walking a bison on a short leash. 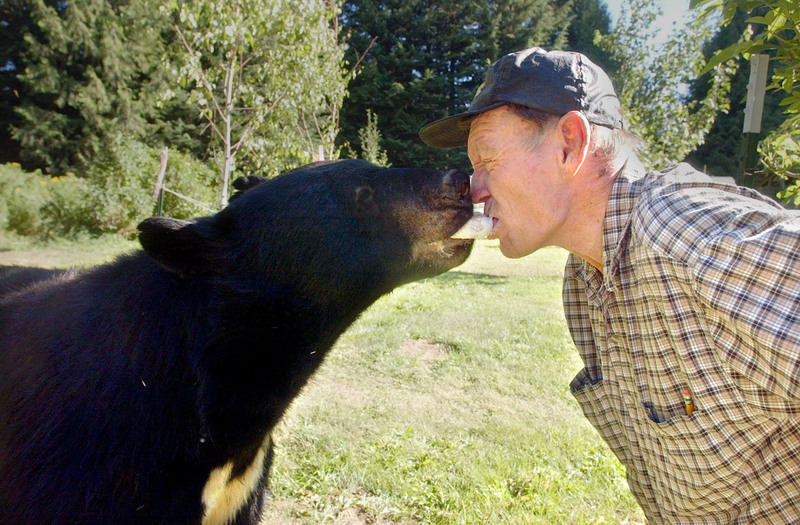 Sometimes people get away with feeding critters such as deer or bears, but somebody else may suffer the consequences, he said. A woman was gored and killed by a mule deer in Oregon some years ago apparently because she didn’t have a food offering for a buck that had been habituated to humans. “A lot of people in Spokane don’t realize that a black bear made it to the red wagon at Riverfront Park and a moose fell into a basement window (in north Spokane),” Bartlebaugh said. Coyotes were aggressive to people using the Centennial Trail last year, Murray pointed out.